Welcome to TINYpulse! You're probably reading this because you've received an invitation to TINYpulse and are wondering what to do next. Good news is, you're in the right place. LIVEpulse: An employee focused tool that allows you to give leaders at your company anonymous feedback by responding to a weekly, one-question, pulse survey. Additionally, you can give anonymous suggestions if there's something in the workplace you think can use improvement, anywhere from transparency to resources, and office layout and snacks in the break room. Cheers for Peers: Spread a little sunshine by recognizing fellow employees, business partners, and more with this fun recognition tool. Perform: Enter your goals, reflect on your progress week over week, keep a to-do list, and get the coaching you need from your leaders in your regular 1:1 meetings. If you've received an email from happiness@tinypulse.com, rest assured that it's legitimately from TINYpulse. Just button the link in the email, or your response to the survey question as pictured above to complete the sign up process. 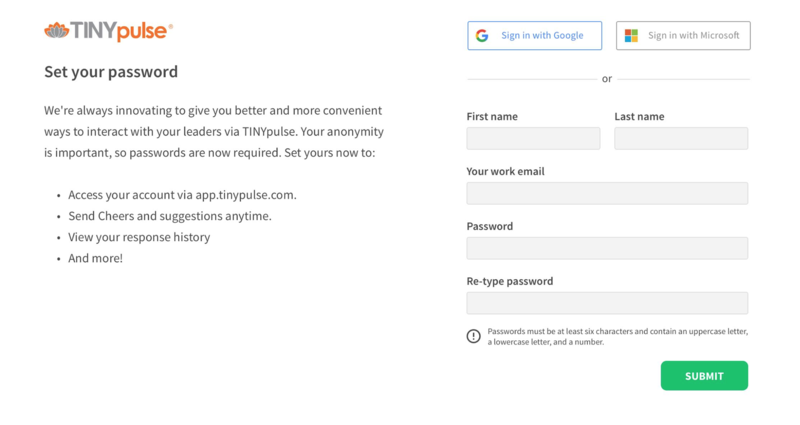 There are three ways to sign up for TINYpulse; but using your G Suite or Microsoft account credentials, or by setting a unique password just for TINYpulse. If you qualify, we recommend you sign up using your Google or Microsoft account to save you time and brain cells. Advantages include not having to remember a separate TINYpulse password, quicker sign in each time you visit TINYpulse, and password protection from those third party providers like periodic password resets. If your company uses G Suite, you can sign up for TINYpulse using that account. Just click Sign in with Google and go through the quick verification so we know it's you. TINYpulse will then pull in your name and sync your password so you don't have to enter them manually. Understand that you must use the same G Suite account to sign up for TINYpulse in which you received the TINYpulse invite email (this is typically your work email address). So if you have a personal Gmail account, but a non-G Suite work email address, you won't be able to take advantage of this integration. If you have a work email address with Microsoft O365, Azure Cloud Services, Outlook, or Live, you can sign up for TINYpulse using that password as well. Click Sign in with Microsoft and you'll be good to go after the verification check. Skip manually entering your name and password because TINYpulse will pull that information from your Microsoft account. Same as with the Google integration, the account you were invited to TINYpulse with has to match your Microsoft account in order to sign up successfully. If you have a personal Microsoft account (O365, Live, etc. ), you won't be able to register it with TINYpulse. Please note that if your company leverages any third party SSO application (like LogMeIn, Okta, OneLogIn, etc) in addition to Microsoft Enterprise software, then you will not be able to use that account to sign up with TINYpulse. Please contact your local administrator for more information. If you don't have a qualifying Google or Microsoft email address, no problem! Just enter your first and last name, password, and upload a profile photo (optional). Click Submit and you're in! Now you'll be able to access TINYpulse at any time by going directly to https://app.tinypulse.com/ and entering your email address and password. Log in at any time to give an anonymous suggestion, send a Cheer, or access your Perform account to update your goals or to-do lists.